Gavin, BDS Manchester 1987, is the Principal Dentist and owner of Dental Solutions. 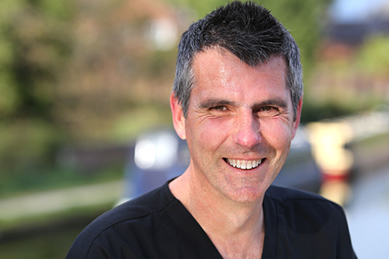 He has owned the Practice in Lymm for 16 years and has a team of 19 dentists, nurses and support staff. Gavin has been a practice owner for over 27 years; before establishing Dental Solutions in 2001, he owned another thriving NHS practice in Warrington. Gavin is a member of the British Association of Cosmetic Dentists and also a Member of the British Academy of Restorative Dentistry. He is passionate about creating great smiles. Much of the dentistry he now performs is associated with dental implants and other major smile transformations. Gavin has been working with Richard Brookshaw for 15 years to create and place over 10,000 implant crowns and bridges that fit onto the implants that Richard places. Gavin has also completed a two-year advanced Dental Restoration course with Tipton Training in order to ensure that the latest techniques and technology can be used in the restoration treatment of implant patients. When not seeing patients and running the practice, Gavin loves to completely relax with a spot of fishing or a round of golf with his son. He is a keen sportsman and coaches and sponsors the Lymm Rovers junior football team and sponsors the Warrington Rowing team.